Australian Founder and Creative Director of Les Héroïnes, Vanessa Cocchiaro grew up in Adelaide and has been living in Paris for the past four years. A former stylist by trade, she worked in the fashion industry for 12 years after cutting her teeth at Harper’s Bazaar Australia under Edwina McCann, who is now the country’s Vogue Editor. When she moved to Paris she landed the role of Contributing Fashion Editor of L’Officiel France, but after more than a decade in the industry, she began looking for something that she could call her own. Inspired by women who have changed history, she launched Les Héroïnes last year as an answer to the lack of elegant and stylish bridesmaid options on the market. The idea came to her after a friend asked her to be a bridesmaid. She suggested she wear a suit and was quickly shut down. She started thinking why was this such a crazy idea? And so the brand was born out of a want to change the mentality behind traditional bridesmaid dressing, and to create pieces that once the duty of being a bridesmaid was over, could actually be worn again and again. Her vision has exceeded itself and she now has a lot of brides wearing Les Héroïnes to their civil wedding or reception. Women are also buying her pieces for evening wear and events, which has been a natural progression for the brand. 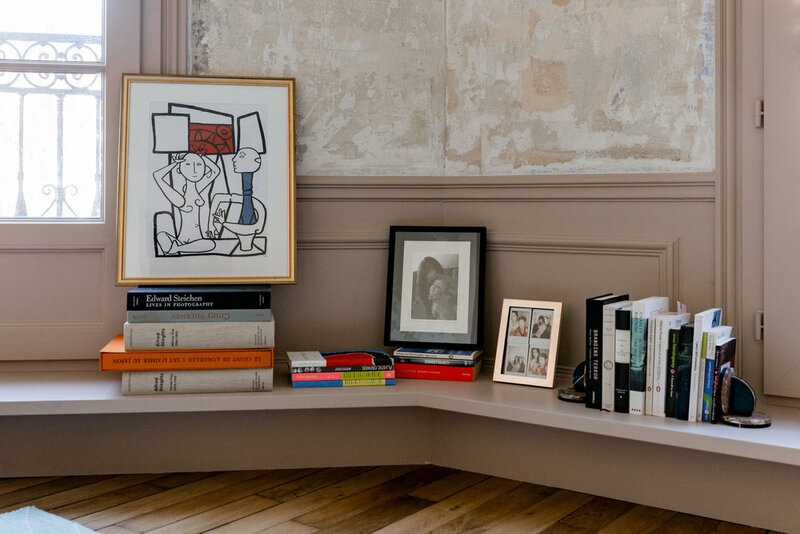 It’s clear that style permeates everything she does from the way she dresses - casual, but with subtle details like jewellery and accessories, which reveal someone who has worked in fashion for many years, but is no victim to the trends - to her taste in books, art and interior space. 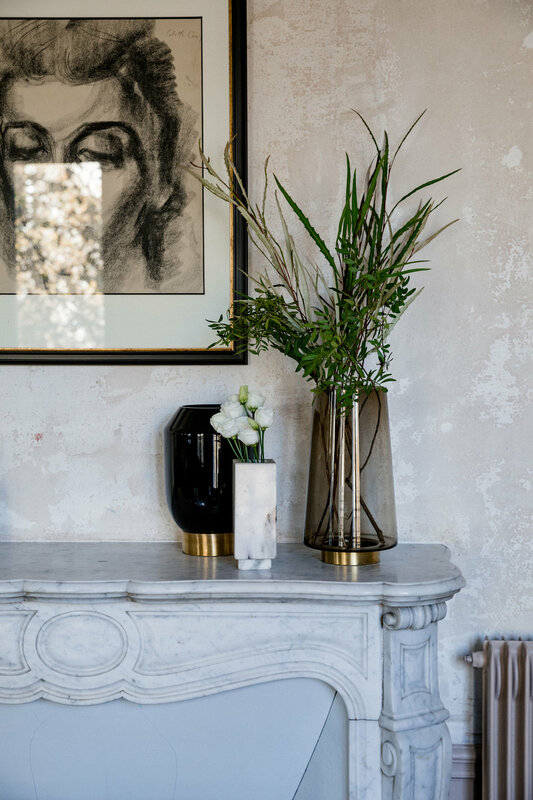 Upon walking into her apartment - which was completely renovated this year - I was immediately reminded of Milan’s ode to Art Deco architecture, Villa Necchi Campiglio, which stars in I Am Love, directed by Luca Guadagnino. It’s fitting considering she has Italian roots and moved to Milan for a relationship, before installing herself in Paris. Her architect and friend, Diego Delgado Elias is Peruvian, but there are obvious Italian art deco influences, with many of the unique pieces being of Italian origin. 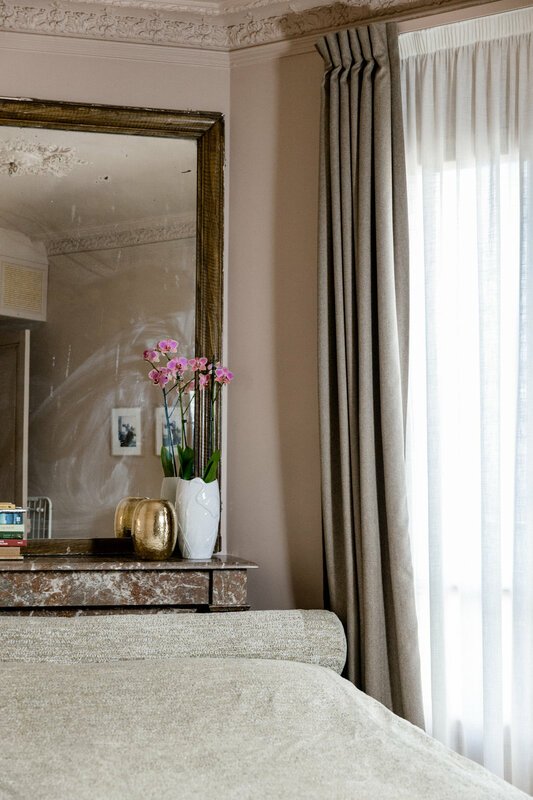 The colour scheme - dusty, antique pink, burgundy and turquoise is perhaps a little unusual (especially for Paris), but perfectly complements the traditional Parisian detailing, which Elias carefully replicated in other areas of Vanessa’s home. The burgundy and white marble in the kitchen, for example is a copy of the marble fireplaces in the dining area and bedroom. 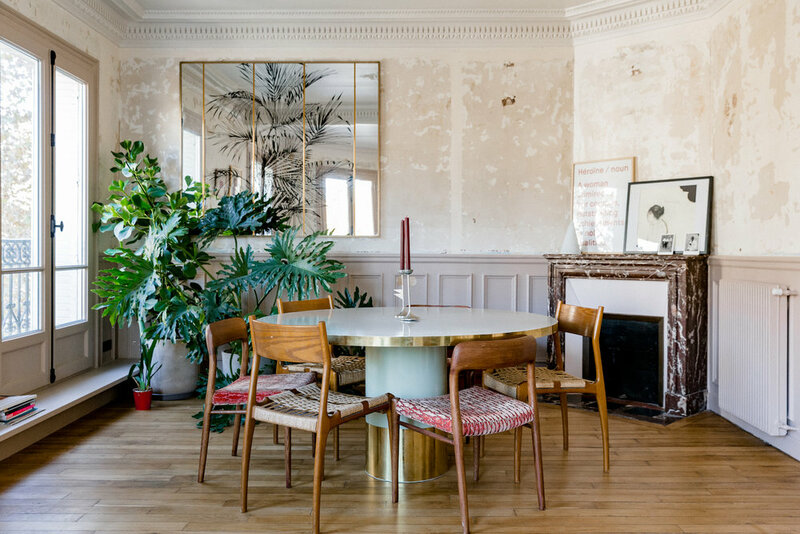 The overall feel of the apartment is cosy, but more than anything it’s an ode to timeless aesthetics that beautifully mirrors the silk and crêpe pieces in Les Héroïnes. Which piece from your collection is your favourite and why? The Gladys double-breasted mustard jacket and Bentley smoking trousers are my favourite. I love the masculine style and it is impossible to be in a bad mood when you are wearing a bright colour like that. The suit will be available in January on Net-A-Porter and Lane Crawford. Always stay true to your vision. What was the most difficult thing about starting your own clothing line? Wow, where to start. I think the most challenging thing for me is the business aspect of the brand. I am a creative person, so it doesn’t come naturally to me. Luckily, I have close friends that are buyers or work in business that have helped me on that side of things. What is your go-to outfit or the outfit you put on when you need an infusion of confidence? A blazer. I can match it with trousers or jeans with a cute mid heal, a great pair of earrings and I’m good to go. What do you like to do for fun? And to relax? For fun, I spend time with my friends. Now I have my new kitchen I have been cooking a lot and have people over for dinner. There is nothing better than drinking wine and laughing with good company. To relax I go to galleries, there is always so much going on in Paris. It is a great way to disconnect and get inspired. Not for long, I moved in in April this year, the construction started in January. What were the biggest decorating challenges? And how did you overcome them? My architect, Diego Delgado Elias was my saviour through this whole experience. Working with him was a dream because I trusted him and knew he would do an incredible job. We had some problems with the mirrors in the kitchen and bathroom. They kept cracking when we would put the handles on, but they worked it out in the end. I am a big fan of vintage, I would say 80% of the furniture in the apartment is vintage. I love Italian, Belgium and French design. I have quite a lot of art deco pieces as well. My light fittings, the large 1920’s art deco piece on the wall in the living room is very special. This piece was originally a ceiling light and Diego my architect had the idea to make it into a sconce. 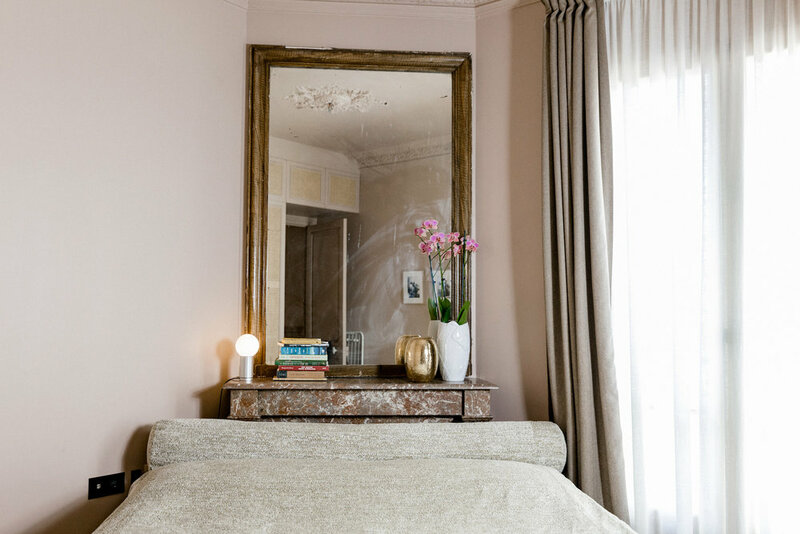 The 1970’s Italian palm mirror in the living room is another favourite, I fell in love with that piece as soon as I saw it! The majority of my pieces are vintage, so we would look online or go to markets. I bought a lot on a site called Selency, they have great pieces for a range of prices. I have quite classic taste, but always modernised. A lot of styles inspire me, I am a big fan of the 70’ and I am obsessed with Bianca Jagger for example. The 19th is a really up and coming area. There are many new bars and restaurants popping up. I am right in between the Canal d’Ourcq and the Buttes-Chaumont park so it is a nice escape from the busy city. Exhibitions, Instagram to see the trends, music, but most importantly, women. My recent resort collection was inspired by female soul and blues singers. All of my pieces are named after influential women that have changed history in some way. They are the heroines of Les Héroïnes. Elena Ferrante, The story of a new name. I should say yoga but it is not true. Coffee and twitter, nothing makes me happier. Red wine, a Parisian must. Les Enfants du Marché, Clown Bar and Le Fontaine de Mars for a traditional French bistro. Astier de Villatte, now they have all of their Christmas decorations on the first floor. It is like walking into a dream.